We equip the office with the latest technology available that can be of use to our patients. Here are some of the technological advances you will find here. Digital x-rays use a small fraction of the radiation of traditional x-rays. A small, highly sensitive sensor is placed in your mouth behind some of the teeth, and this records the x-rays. These photographs can then be displayed immediately on a computer monitor and will be available throughout the office. Another key advantage is that the resulting images can be magnified, inverted, or colored to yield more diagnostic information than used to be available with conventional radiographs. Shade vision digitally scans the colors in your teeth to allow for very precise color matching. This assists Dr. Gavrilos in creating perfectly matched porcelain veneers, crowns, and bridges and in working with dental bonding materials. The scans also make communicating with the master ceramist much easier, leading to better outcomes for patients. 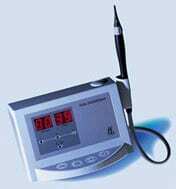 Diagnodent is an early detection system for tooth decay. Even the most experienced dentist can miss decay for a variety of reasons. Sometimes decay that develops in deep grooves cannot be reached with a dental pick, and the result is often a larger pocket of decay. The Diagnodent device can detect this kind of decay, and early detection preserves more of the tooth. e.max crowns are made of a very tough ceramic that is strong enough, when used with modern bonding technology, to eliminate the need for porcelain-fused-to-metal crowns on the front teeth. They also eliminate the dark gum line that always develops within a few years of having traditional metal-based crowns placed. And they have many of the same qualities as tooth enamel, allowing them to look as natural as your own teeth. Another innovative tool Dr. Gavrilos’ uses to enhance your experience is the 3Shape TRIOS® intraoral scanner. This fast, accurate digital system delivers realistic impressions in no time at all. Our patients love that fact that this innovative tool means no more uncomfortable, gooey impressions. This sophisticated technology system makes scanning simple, more comfortable and fast, which means less time in the chair for you.